Tony Candon, manager/keeper, National Museum of Ireland - Country Life, second left with Tom and Fintan Murphy who donated a number of books to the museum and Noel Campbell, assistant keeper. Photo: Keith Heneghan. A beautiful collection of 19th century books, including bound volumes of the famous satirical magazine Punch, has returned home to historic Turlough Park, now the National Museum of Ireland - Country Life. 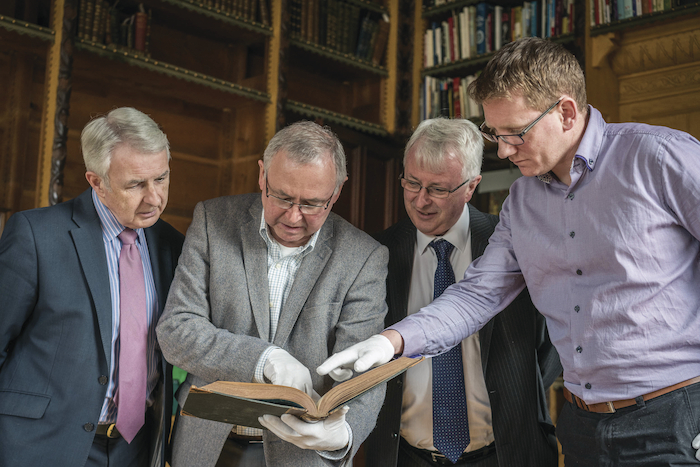 Brothers Tom and Fintan Murphy from Castlebar recently approached the National Museum of Ireland - Country Life about donating a collection of historic books on behalf of their parents, the late Thomas and Sue Murphy of The Green, Castlebar. On closer examination of the books, assistant keeper at the museum, Noel Campbell, discovered the bookplate inside several of the book covers belonged to Charles L FitzGerald, landlord of the Turlough estate from 1854 to 1902. Turlough was the ancestral home of the FitzGerald family for more than 300 years before it became the site for a branch of the National Museum of Ireland in 2001. A powerful family of Norman origin, the FitzGeralds first came to Ireland in 1169 but were transplanted to Mayo and given the Turlough estate during the Cromwellian conquest in the mid-17th century. Charles Lionel FitzGerald is a hugely significant figure in the FitzGerald family history, as he was responsible for building Turlough Park House and carrying out significant improvements to the gardens and parkland surrounding the house. Now, thanks to the Murphy family, some of Charles Lionel’s books are back in the original library he constructed at Turlough Park House. The volumes of Punch magazine span the period 1861 to 1870 while a series of European history volumes date to the 1920s. It is easy to imagine Charles Lionel FitzGerald leafing through Punch magazine at Turlough Park House in the 19th century. By the 1860s, the conservative magazine was an essential addition to the drawing rooms and personal libraries of the upper classes. It was known for its biting satire and detailed illustrations which mocked many of the leading British and Irish political figures of the day. Editions of the weekly publication were often bound in volumes by year, just like the collection donated to the museum, which were bound at the offices of the now defunct Mayo Constitution newspaper in Castlebar. “We are delighted the books are finding a good home here at the National Museum of Ireland,” said Tom Murphy, of Baloor, Castlebar. “It is of great interest to us that the home they are finding is the one from which they originally came,” added Fintan Murphy, Westport Road, Castlebar. “The National Museum of Ireland – Country Life is very grateful to the Murphy family for this donation. The fact that this collection of books has such an important connection to the history of the FitzGerald family and Turlough Park House makes this donation very special indeed,” said Noel Campbell, assistant keeper of the National Museum of Ireland - Country Life.